Explore these great things to see and do in the Amami Islands, from a mangrove forest to waterfalls and gorgeous ocean scenery. Tucked away down a narrow footpath, very few tourists know about this hidden gem of a beach. Kasarizaki Lighthouse sits at a scenic spot on the most northern point of the island, known as ‘Yo Misaki’ Cape to the locals. This park is more than just a pretty spot to take in the sunset – it is also an important historical site. Take in some local arts and culture at the Amami Park, located just a few minutes from Amami Airport. The Amami Nature Observation Forest lies in the lush Nagakumo mountains, and is full of fun activities to help you connect with nature. A secret ‘power spot’ that only appears at low tide, this beautiful heart-shaped tide pool lies on the east coast of Tatsugo Town. Long-loved by locals, Materiya Waterfall is a great place to relax and swim in the clear waters which tumble from the forests and mountains above. Kuninao Beach with its white coral sand and pristine waters is a popular beach both for day trippers and for campers who want to stay longer to enjoy the area. The best way to explore Amami’s Mangrove Park is by canoe, so get ready to use your arm muscles! One of the best waterfalls of the Amami islands, Arangachi Falls tumbles from a height of roughly 30 meters into a beautiful basin. You might hear it before you see it – the sound of the gentle tumbling of round, smooth stones being turned over in the waves. 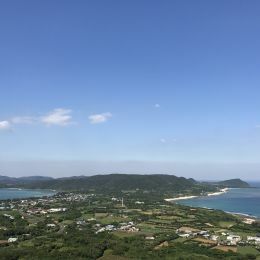 This beautiful cape, about a 15 minute drive north of Amami Airport, offers splendid views of the Pacific Ocean, and is a popular spot to watch the setting sun. This handicraft is unique in that it is only produced on Amami Oshima island. Oshima Tsumugi silk fabric has a history of some 1,300 years. Take a walk through a primeval semitropical forest and see plants and animals which are unique to Amami, such as the Hikagehego, or Flying Spider-Monkey Tree Ferns. With gorgeous beaches for swimming and lots of facilities, Ohama Coastal Park is a great place to spend the day relaxing and snorkeling. Luckily for visitors, Tomori Beach is the closest beach to Amami Airport, and is considered one of the most beautiful beaches on the island. When in Amami Oshima, you must try the local specialty, Keihan. Kokuto Shochu is a non-alcoholic liquor, made from pure brown sugar and semi-fermented rice. Learn about Amami’s distinctive history and culture at the Amami Museum, with displays of traditional life, customs, and natural science.